Being a coach demands a high level of self-awareness because it's hard to support others in their development when you aren't in a good place yourself. Part of my personal growth process over the past few years has been coming to terms with who I am and being real about what drives and inspires me. Leadership is a misused and misunderstood concept that people aspire to without knowing what it really means. In most of my academic and professional life I too sought after this grand image of a power woman that I had constructed in my head. Though the more I studied and observed what leadership actually was (and wasn't) the more I realized it's not a pursuit I want to build my career or personal life around. 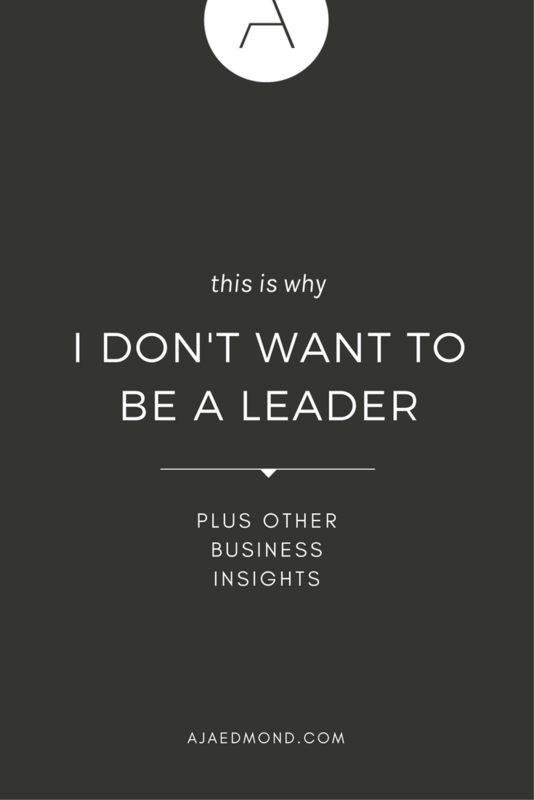 Despite going to business school, having a wealth of leadership training, coaching leaders, and being successful in leadership roles, I feel good openly admitting that I don't want to be a leader. I wrote this for myself but also for fellow free spirits who feel hesitant about stepping away from traditional career paths to do independent work or start small businesses. Here's my personal perspective on why walking away from this archaic idea of leadership is a great move. Need a robust set of resources that'll help you live on your terms? Ready to stop living someone else's dream and redesign your work and life? The key to achieving this is developing a growth mindset — use my robutst collection of personal, creative and business resources to start. Teamwork. Team meetings. Team calls. Team huddles. Team building. I don't enjoy them it. There are two things that, without fail, bring me joy and dread in life. The moment right before spending a stretch of uninterrupted time alone, and the moment right before that alone time must come to an end. It doesn't mean I'm not collaborative or socially adept and certainly doesn't mean that I can't thrive in the midst of large groups. I just happen to have one of those rare personality types (INTJ) that strongly prefers to spend most of my time in my own head. I'm quick to step up and take the helm if needed, but actually enjoy chilling out in the background. Yet this is a critical component of leadership: you have to like people and like being around people in order to lead them. I'm perplexed by "leaders" who are socially awkward, have low EQs, and lack charisma. If you don't have a knack for connecting with people and get energy from these types of settings, it could mean that leadership is not for you. Some may argue that you can work on improving your skills and evolve over time ... but no amount of training will change the core of who you are as a person. And why should it? Why not embrace your innate abilities instead of ignoring them to pursue roles that don't suit you? I love the concept of life and business coaching because you aren't trying to probe and prod someone into doing something. Your most important role is to be a purveyor of ideas for the client to consider and integrate into an action plan they will carry out themselves. I'm a thinker and value ideas over everything: money and relationships included. I don't want to influence people. I want to develop ideas so powerful that they influence people. The thing about leadership positions, at least in business, is that a disproportionate amount of time is spent worrying after others. You no longer have as much time to be a strategist, a creative, or a marketer, because you must spend your time rallying the team to achieve these goals. You may be a visionary only 25% of the time because the other 75% is needed to actively train and manage your subordinates to ensure they can carry that vision out. It's a rare person who can build teams and ideas without shortcutting on one or the other. I can't, so I opt for the latter. For me to want to be something, I have to have a seed of desire planted in me and watered over time. However, there has been no one in my business life who has ever inspired me to the level of wanting to emulate them. I think it's a shame and find it really disheartening that I've rarely been professionally inspired within any organization I've worked for. This is one of the main reasons why I left the corporate world to venture out on my own. I've had a wide range of managers in my 9-5 days. Many incompetent, most average, and a select few that were truly exceptional – at management that is. When you manage, your mind is set on the task at hand. You plan, organize, and coordinate to ensure you check the boxes on time. Though you may care about your team, you are primarily project focused and people are one, of many, sets of resources that help you complete that project. When you lead you don't just see tasks and projects but the greater vision. You understand that in order to add real value you need to bring out the best in your team. You accomplish this by using emotional intelligence to understand each of them as unique contributors to the higher cause. As a result of this understanding you recognize how to influence and inspire, empower and motivate, while accomplishing all the projects and tasks along the way. I can pull only two examples out of my entire career where I felt I had actually grown as a result of working under someone. Before then and ever since, I can't recall ever having this type of inspiring experience in a business setting. When I think of leadership I often have the image of a captain of a ship who goes down with it after trying to save everyone else on board as it sinks. Of course this is just one dramatic example of leadership but it captures a critical concept: ultimate responsibility. When the sh*t hits the fan (whatever that may be) I want to have the moral freedom to decide to save myself and who or what I care about most. I'm a woman with values, so if operating in a leadership capacity I know I would feel compelled, forced even, to make decisions in the best interest of those looking up to me, instead of what's just best for me. Thing is, I don't want that kind of responsibility. I'd like to believe that I'm a completely selfless being, ready and willing to fearlessly lead her followers through troubled waters. But I'm not so sure I am. I don't need to be written up in the history books, I'm ok just watching Game of Thrones for an occasional dose of heroism. Many wannabe leaders are in it for the wrong reasons. They want power, money, glory, titles, and status, but aren't ready to step up to the real challenges that come with having the well-being and livelihood of others in their hands. If your idea of leadership is bossing people around or getting a false sense of importance from egomaniacal behavior then you too could benefit from a reassessment of how you can add real value to other people's lives — in another more suitable capacity. The best leaders are those who practice principles of minimalism, even if inadvertently. They have a natural ability at (a) crafting clear and focused visions, (b) developing consistent and disciplined methods for carrying these visions out, and (c) connecting with and charming people into action. At the core of minimalist leadership is genuineness. The inauthentic leader has a difficult time with one or more of these traits because, in reality, they either don't like doing these things or aren't good at them. The organic leader doesn't have to hide behind a facade. These traits aren't forced and, as a result, there is an air of refreshing simplicity in their style, even when dealing with complicated issues. I don't feel my true self when operating in a formal leadership capacity because my ability to do (a), (b), and (c) is only organic in casual settings — and on my own terms. I'm at my best when I don't have to prove anything to anyone except for myself. Leadership is only effortless for me when it's a choice instead of a mandate. I recognize it's a bold move — some would say career limiting — to publicly proclaim my disinterest in what most professionals think is the pinnacle of any career worth having. It could prevent me from obtaining a high-paying senior level opportunity overseeing important initiatives with a dozen or so direct reports at my beck and call. But that's the beauty of the simple life I choose to live. I eliminate subpar options — even if it defies social norms — so I can go all in on the few things that matter most. In a sense, my priority is to be a leader of self. In the mere act of mastering personal excellence I can indirectly inspire and influence many people — as an example rather than an authority figure. Don’t want to be a leader and ready to live and work on your own terms. Schedule a complimentary coaching session and let’s explore how I could help you step confidently into your own sense of purpose.